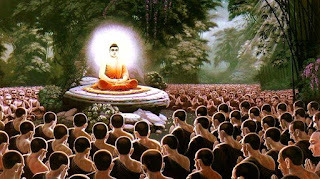 After the disappearance of the teaching of the Buddha Gotama, there will arise another Buddha, Metteyya (Pali) is regarded as a future Buddha of this world in Buddhist eschatology. No definite number of years is given for the period between the Buddha Gotama and the Buddha Metteyya. According to the Cakkavatti Sīhanāda Sutta, he will be born, when human beings will live to an age of eighty thousand years. It is stated that in the very distant future the continent of Jambudīpa (India) will be a powerful and prosperous one. Vārānasi will be a royal city called Ketumatī. There will arise a king called Sankha, a wheel-turning monarch. The king, will live in the fairy palace where once dwelt King Mahāpanadā, but later he will give the palace away and will himself become a follower of Metteyya Buddha. According to the Anāgatavamsa the Buddha Metteyya will arise ten million years later, in this auspicious world cycle, in the future, there will be an Awakened One named Metteyya, a fully-enlightened Buddha. He will be endowed with wisdom and conduct, a Knower of the worlds, an incomparable Trainer of men to be tamed, a Teacher of gods and humans, enlightened and blessed. He will teach the Dhamma in the spirit and in the letter, and proclaim the holy life in its fullness and purity. He will be attended by a company of thousands of monks. *The Anāgatavamsa is a poem of 142 verses, a history of the ten future Buddhas. It is written by Kassapa of Cola. It can be dated to the end of the fourth or the beginning of the fifth century. One named Ajita will be born, Metteyya, of great power, incomparable. He will be born in a brahman family, with great wealth and possessions. At that time, Metteyya’s mother will be named Brahmavatī, his father Subrahma will be the head priest of king Sankha. Four palaces will have come into being for Ajita. Candamukhī will be his wife. Brahmavaddhana will be his son. He will live in a household for eight thousand years.The women will marry at the age of five hundred. On one occasion he will go to a park for pleasure to amuse himself. Seeing the danger in sensual pleasures and being wise in accordance with the nature of Bodhisattvas, he will see the four signs: an old man, a sick man, a dead man, and a happy wanderer. Having sympathy for all beings, he will go forth seeking the supreme state of peace and accompanied by a fourfold army, at the head of which will be eighty-four thousand brahmins and eighty four thousand Khattiya maidens. Among his followers will be Isidatta and Pūrana, two brothers, Jātimitta, Vijaya, Suddhika and Suddhanā, Sangha and Sanghā, Saddhara, Sudatta, Yasavatī and Visākhā, each with eighty four thousand companions. Together they will leave the household and arrive on the same day at the Nāga tree (The Nāga tree will be the awakening tree for that Blessed One). He will go to the garden Nāgavana and there he will set in motion the incomparable Wheel of the Doctrine. The Buddha’s lifetime will be 80,000 years. Then, in the midst of the venerable order of disciples who will have done what should be done, that Conqueror will blaze out like a mass of fire, and be extinguished. His Teaching will remain for 180,000 years. After the Enlightenment the Buddha will preach in Nāgavana and King Sankha will, later, ordain himself under him. After the Buddha's death, his teachings will continue for one hundred and eighty thousand years. At the present time the future Buddha is living in the Tusita deva-world. *Our DhammaUS editor here wants to share a bit of a background of the Future Buddhas while wishing that near & dear ones, family & friends, all the readers and will meet the Enlightenment One in the future birth, ordain under Him and achieve the supreme bliss of Nibanna under His guidance. May this noble objective and wish come true! May all beings be well & happy & healthy! Sādhu! Sādhu! Sādhu! The Anāgatavamsa is a poem of 142 verses, a history of the ten future Buddhas. It is written by Kassapa of Cola, it can be dated to the end of the fourth or the beginning of the fifth century.